Every night from May through September thousands of bats feed on insects over Capitol Lake in the center of Washington State’s capitol city, Olympia. While the lake reflects the Capitol Dome in the dusk, bats are weaving back and forth over the lake as they eat, staying for up to six hours a night. It’s “women and children first” for these bats. While pregnant and nursing females feed at Capitol Lake, the males are found at higher, cooler elevations, benefiting our forests by eating insects there. Townsend's Big-eared Bat, which is on the state and federal Species of Concern lists and which is considered one of the rarest mammal species in the Northwest. Visit Our Bats to see descriptions of each bat species, hear bat calls, and learn about bat biology. A Night at Capitol Lake shares the details of a typical summer’s night bat activity. Woodard Bay talks about Washington’s largest bat colony, where visitors can watch the female bats emerge at night and begin their long commute to Capitol Lake. Capitol Lake is a human creation in an area where the Deschutes River meets Puget Sound. An intense and complex debate is currently going on about the future of the lake. Input from the public will be sought in March-May of 2009. At stake is whether the lake will remain, whether it will be drained to create a tidal mudflat, or whether a combination of the two options will be chosen. The Deschutes River has been polluted for some time. Much of this pollution has been captured in the Capitol Lake basin, which has not been dredged recently. Whether water from the river flows first into a lake or directly into Puget Sound, until the Deschutes River is cleaned up, pollution will be brought into the area. 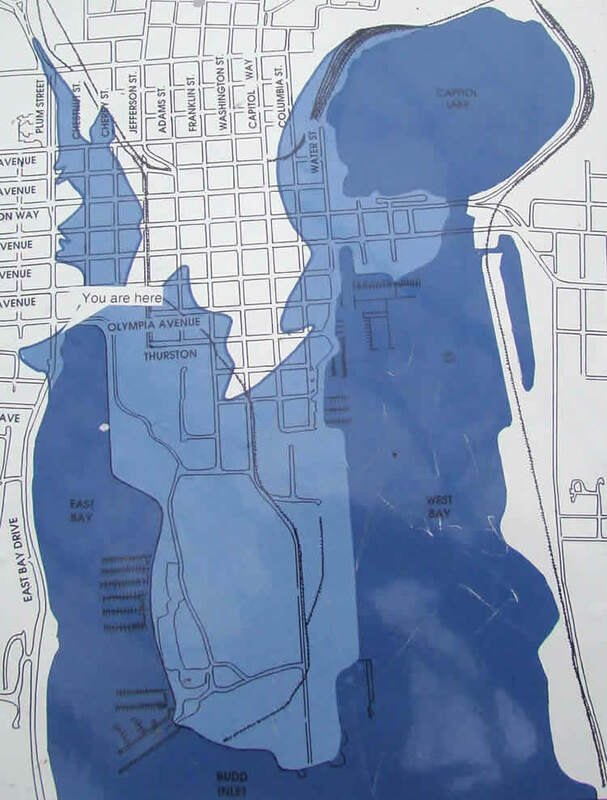 Twenty-nine blocks of downtown Olympia and portions of the Port of Olympia were created starting in 1909 by filling in the estuary of the Deschutes River with landfill, and at the same time dredging out a portion of what is now East Bay. Then in 1951 a dam was built by the current Fifth Avenue Bridge, creating the 260-acre Capitol Lake from an area that used to be a tidal mudflat. It is possible that this area may be returned, in whole or in part, to a tidal mudflat by removing the dam. This will partially recreate a portion of the former estuary within dramatically altered landforms. This interpretive sign shows the former shoreline of Olympia and the landfill. Fill is in light blue. The water features that exist today are shown in dark blue. Note that the bottom of the map points north. Only the northernmost part of Capitol Lake appears on the map. For more on history, see the General Administration website’s history of the lake. For current studies and deliberations provided by the working group charged with choosing a preferred plan for the lake, see the Capitol Lake Adaptive Management Plan. A Washington State Department of Fish and Wildlife study examines the impacts on wildlife of each of three alternatives: keeping Capitol Lake as is, draining Capitol Lake to create a tidal mudflat estuary, or a combination of the two. Several thousand species are diagramed showing results for each option. Many species would gain from the change to an estuary, such as salmon, other fish that swim in both salt and fresh water, and a variety of birds (including surf scoters, goldeneyes, herons). Others would lose from draining the lake, such as bats, freshwater fish, and a different group of birds (including swifts, Purple Martins, swallows, gadwall, wigeon, mergansers). The bats now feeding at Capitol Lake would be negatively impacted by draining the lake and creating a tidal mudflat. The insects that regularly hatch all summer from the lake have been a stable food source for thousands of female bats living in Thurston County and for their growing pups. Removing the food source will result in bat deaths—and no one knows how many would die. Bats reproduce very slowly, a maximum of one pup a year for the Yuma and Little Brown Bats. Once harmed, a bat population takes a long time to rebuild. Bats live a long time, and form very stable patterns of feeding. In 2008, a pregnant female Little Brown Bat was captured and released near Roy, WA that had a band placed on her wrist in 1992. She was caught near the same spot as in 1992, showing how stable the association between a bat and a particular territory can be. We can assume that many of the bats using Capitol Lake also have been visiting the same section of the lake year after year, and may have great difficulty in finding alternative feeding sites. Good water quality in Puget Sound is essential to the health of our ecosystem. We support cost-effective projects that have a good prospect of making favorable impacts on Puget Sound ecology. Our members are currently divided on the question of whether restoring part of the historic tidal mudflat would achieve those goals. The bats should be part of the discussion about alternative futures for the lake. Any scenario for the future involves dredging the lake. Do not dredge while the pregnant, then nursing, females are eating at the lake—that is, do not dredge May through September. While the bats are still here, use their presence to educate the public about bats—our mammalian cousins that are often feared and maligned.